Youve got to see the Retina 5K iMac to believe it! The refurbished Late 2014 27-inch iMac with Retina 5K display has a resolution of 5120 x 2880 pixels. Thats 4x more pixels than a standard 27-inch iMac. The refurbished Retina 5K iMac is the best choice for when you really need to see what youre doing. The clarity is astounding. But theres a lot more than what you can see on the screen. The pre-owned Late 2014 iMac has fast Wi-Fi, Thunderbolt 2 ports, fourth generation Intel processor and a Fusion drive that gives you both high capacity storage and faster data access. 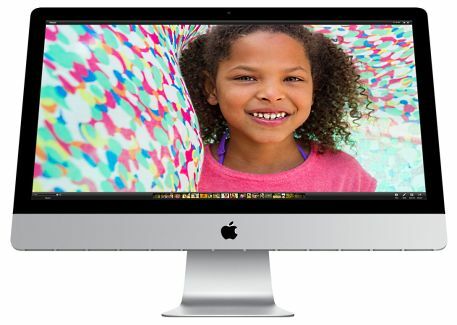 Best of all, GainSaver has the refurbished Late 2014 Retina 5K 27-inch iMacs at the lowest price anywhere! And with our 30 Day Money Back Guarantee, you can shop with confidence at GainSaver. The resolution of the Retina 5K 27-inch iMac is 5120 x 2880. Its called 5K because there are over 5,000 pixels horizontally. All together, the Retina 5K iMac has 14.7 million pixels packed into its 27-inch screen  about 4x more than a standard, non-Retina 27-inch iMac. But numbers cannot prepare you for the experience of using a screen with such detail. Its truly amazing. Along with the higher resolution, Apple engineers also enhanced the color and brightness of the Retina 5K display to provide blacker blacks and move vibrant colors that are a pleasure to see. Images practically jump off the screen. It takes a lot of computing power to keep 14.7 million pixels moving in unison. And the AMD Radeon graphics processor is up to the task. It keeps your images flowing smoothing with its 3.5 teraflops of power. The refurbished Late 2014 iMac with Retina 5K screen makes for an awesome game platform, as well as the centerpiece for a video production studio, or busy workstation in your science lab. The refurbished 27-inch Retina 5K iMac has all the power you need for the most demanding applications you use. No matter what youre doing, from graphics design to music and video production to crunching big data, the Quad Core i5 can power through it. Running at a blazing 3.5GHz, each core can process instructions individually, and when even more speed is required, the fourth generation Intel processor automatically kicks into Turbo Boost speeds of 3.9GHz. One way the refurbished Late 2014 iMac speeds up your work is to use two separate hard drives  one of the drives is a traditional high capacity drive, and the other is a much faster SSD flash drive. Over time, the operating system knows which files to keep on the flash drive for quick access, and which less frequently used files should reside on the other drive. Each drive can be independently configured for you by GainSaver technicians, so you can get the best of both worlds. Make sure to review the available options in the GainSaver Configurator before you check out. When youve decided on the options you want, just click the Buy Now button.